CheriB Designs: Snowman Wishes Release! Hi Digi Doodle Studio Fans! Today is the New Release over at the Digi Doodle Studios online store called "Snowman Wishes"! 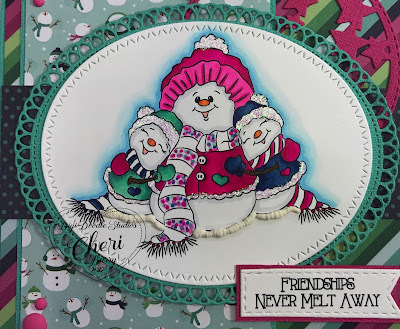 I am using the super cute "Snowman Hugs"! I can never get enough of Snowmen, so this release is right up my alley!! I chose to use papers from the Pebbles Winter Wonderland collection. I love the pink/blue/teal combination! So pretty and not traditional at all! I started by printing out my image and then colouring it with my Copic Markers. I used a Loopy Oval die to cut out the image and then assembled my card. I love doing lots of layers! The sentiment is from Digi Doodles as well and is from the "Snow Wishes" Digital stamp set. I added some Stickles and some Liquid Appliqué that puffs up when you heat it up! Both add a fun detail don't you think? I love using my scraps from my projects to decorate the insides of my cards! This sentiment is also from the "Snowy Wishes" set. I also wanted to mention that I am now a full time Designer for DDS! I am so excited to be joining the team and creating with Dina's amazing digital stamps!! Make sure you hop on over to Digi Doodle Studios and check out all the super cute new Snowmen!! OMGee! I so love everything about this! Your colouring is amazing! and the layout, paper and dies are perfect!!! Just Wow!! !